Received: November 1, 2018; Revised: December 11, 2018; Accepted: December 11, 2018; Published online: January 31, 2019. Although the frequency of ingested foreign bodies is high, Penetration and migration is a rare and dangerous condition, with possible lethal complications. We report an infrequently case of migratory fish bone in the neck, treated with mini-invasive image guided surgery. Although the frequency of ingested foreign bodies is high, Penetration and migration is a rare and dangerous condition, with possible lethal complications. The rates of complications increase in those cases when the foreign body was delayed more than 24 hours. We will show an infrequently case of migratory fish bone in the neck, treated with mini-invasive image guided surgery. A 61-year-old woman was referred to our team with light symptoms of discomfort in the lower third of the neck. The patient reports to us a situation occurred 6 weeks before, when she was eating a grilled river fish. At that moment, she felt that a fish bone had stuck in her throat. She was examined in an emergency service and she underwent a fiberoptic laryngoscopy and esophagoscopy one day after. The study showed normal findings. The uncomfortable throat sensation became alleviated two days from the swallowing episode. At the moment of our first contact with the patient, we found a mild tenderness on the right lower neck as unique change. The patient had been evaluated with ultrasonography (Fig. 1). It showed us a hyperechogenic image crossing the right sternocleidomastoid muscle and leaving it in its superficial face towards the subcutaneous cellular tissue. All this calcic structure was surrounded by a small hypoechoic halo. The superficial end of the foreign body was lodged just 3 mm below the skin (Fig. 2). The total length of the fishbone was 34 mm (Fig. 3). With the diagnostic of foreign body, our team decided to remove it. The planning was an image guided less invasive procedure with local anaesthesia, but in a surgery room with the anaesthesiologist and all the instruments needed for an exploratory neck surgery. The patient underwent surgery at all times awake under local anaesthesia. 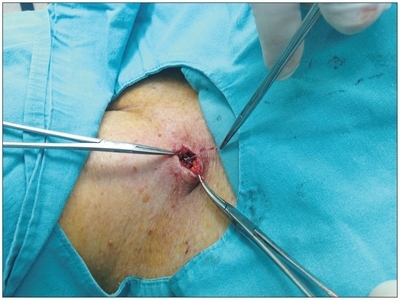 The procedure was with a 5 mm incision (Fig. 4) and guided by ultrasound all the time. Follow the skin incision, a soft dissection was made and the superficial end of the foreign body was found. We grasped gently the tip of the fishbone and pulled it out in the direction that it was coming out spontaneously. The extraction of the foreign body was successful and the intraoperative ultrasound follow-up showed that it was completely removed. The patient was very surprised and grateful at the moment our team showed her the fish bone. The patient was discharged 2 hours later and the evolution was uneventful. In our case, it is probably that the fish bone needle-shaped stuck in her cervical esophagus and spontaneously it migrated out of the lumen anteriorly, penetrated through her esophageal wall and laterally through the neck inside the right sternocleidomastoid muscle, and reached her anterior cervical hypodermis in the course of 6 weeks after she swallowed the fish bone. Ultrasonography showed us the whole fish bone and its relationship with the neck structures and without any dangerous organ invasion at the moment of the diagnosis. The nearest of one of the end of the fish bone to the right lateral neck surface and the safe distance of the vital neck structures, allowed us to design a mini-invasive planning ultrasound guided. There are few reports of migratory fish bones that have remained in the neck for a long period. We didn’t be able to find other case reported of fish bone foreign bodies removed by mini-invasive ultrasound guided surgery. In conclusion, in some specific location, migratory foreign bodies in the neck, could be treated safety whit mini-invasive image guided surgery. Fig. 1. Neck ultrasonography of the patient’s neck showing a hyperechogenic foreign body inside the sternocleidomastoid muscle and coming out to the hypodermic neck space. (A) Neck ultrasonography with linear probe ultrasonography. (B) Hyperechogenic foreign body was detected inside the sternocleidomastoid muscle. (C) The linear structure was running through the hypodermic neck space. (D) The superficial end of the foreign body was lodged just below the skin. Fig. 2. (A) Mini-invasive image guided procedure. (B) Ultrasound shows the superficial end of the foreign body. Fig. 3. A 34 mm needle-shaped fish bone. Fig. 4. 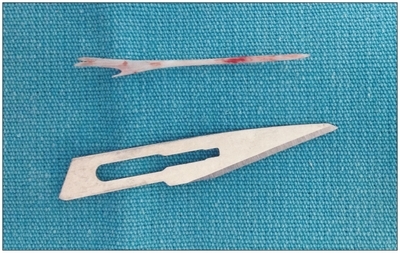 Foreign body (fish bone) grasped and removed from the 5 mm incision. Siessegger M, Mischkowski RA, Schneider BT, Krug B, Klesper B, Zöller JE. Image guided surgical navigation for removal of foreign bodies in the head and neck. J Craniomaxillofac Surg. 2001;29:321-5. Watanabe K, Amano M, Nakanome A, Saito D, Hashimoto S. The prolonged presence of a fish bone in the neck. Tohoku J Exp Med. 2012;227:49-52. Ohbuchi T, Tabata T, Nguyen KH, Ohkubo J, Katoh A, Suzuki H. Thyroid gland cutaneous fistula secondary to a migratory fish bone: a case report. J Med Case Rep. 2012;6:140.